Metal detectors create a magnetic field. When this field comes close to something metallic, the metal detector senses the change and tells the user. Can One Detector Really Do it All? Most detectors are designed to excel at one type of hunting or another but can be used for other types of hunting as well. For example, most gold prospecting machines use some form of higher gain in the circuitry to get better sensitivity to small gold nuggets in the ground. While this is a good thing for prospectors, coin hunters may find it annoying that their detectors are picking up every bit of a pull-tab that has been run over with a lawnmower. The art of metal detector design is the art of compromise. By accenting certain characteristics of any detector, you take away from other features. Any detector that does it all may not work as well for certain very specific treasure hunting. Talk to as many people as is possible and be realistic about your hunting needs. Finding a detector with the features that will best suit your hunting style is the most important choice you can make when deciding on a new detector. 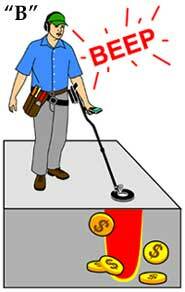 Call 1-888-535-5926 to speak to a certified metal detector expert. There is not any one metal detector that is best for everyone. The easiest way to find the "best" detector is to evaluate your detecting style, your experience level, and the time that you will spend hunting. After taking all of these things into consideration, then you will be able to find a detector that fits your needs and your budget. How Much Better is a $1000 Detector Than a $200 Detector and in What Ways? The answers to these questions are connected, so I will try to answer them together. Generally speaking, the higher the price of a detector, the more features that it will have. More features translate into more knobs. The more features and/or knobs that a detector has, the more you are able to tune the detector to the type of hunting conditions that you are likely to encounter. Will Metered Detectors Find Coins Deeper Than Non-Metered? The use of a meter on a detector is no longer any indication of its depth capabilities. When metered machines were the top-of-the-line machines, engineers matched the detectors with the best possible circuitry. With the advent of more cost effective digital signal processing and LCD displays, there are a number of units available that are inexpensive and have meters. While these detectors have acceptable depth, there are plenty of other machines that have better. The main thing to remember is that a metered machine will give an accurate audio signal on a target much deeper than an accurate meter reading. Air tests are a good indication of the ability of any display-type detector, but once the target is in the ground, there are several variables that may come into play affecting the reading. The most common is the fact that pull tabs and gold rings fall into the same area based on the mixing of alloys. The orientation in the ground can also cause some confusion for the detector. If you choose to get a metered machine, dig any target that gives a good audio signal regardless of the meter reading. You may dig up more trash, but in the long run, you will find more desirable targets. Is a Crystal-Controlled Detector Better Than One That is Not Crystal-Controlled? Most manufacturers use crystal resonators in their machines because of the tight tolerances of the resonator. If the part is listed as 15.7 kHz, all parts will be exactly that frequency. The downside of these super tight tolerances is that the detectors are more likely to crosstalk with each other. In other words, transmitted and received signals from two or more different machines will start interfering with each other. Two frequency machines may combine a pair of SINE waves but are more likely to use a square wave.Multi-frequency machines almost always use a square wave or modified square wave. Square waves are rich in harmonics and take more battery power to generate. Harmonics generated by a square wave can be counted as individual frequencies and can be used to give more information as to target type and depth. There are two main types of metal detecting coils currently on the market—the concentric and the wide scan. The concentric coil uses two round antennas, one inside the other. This coil is used on most detectors that are designed for coin, jewelry, and relic hunting. Concentric coils discriminate very well and pinpoint very easily due to the fact that the strongest signal is always in the center of the coil. Wide scan coils use two D-shaped antennas that are placed back to back. Because of this configuration, they are also called "double-d" coils. The wide scan coil is less affected by mineralization than the concentric, so it is generally used for gold prospecting or relic hunting in bad ground. Pinpointing is done with the heel or toe of the coil. After determining the type of coil that is best for your type of hunting, the next thing to consider is the size. Smaller coils will concentrate the signal and make the detector more sensitive to the little targets. Unfortunately, smaller coils tend to lose depth when compared to their larger cousins. Being that these coils don’t have as wide a search pattern, they are also less likely to mask targets in trashy hunting situations. If you look closely at the advertisements of most so-called hot coils, you will find that they are slightly larger than the stock coils that they are replacing. As noted above, a larger coil may go deeper, but it has other drawbacks that may make it unsuitable for your particular style of hunting. Most manufacturers already make coils that are larger than the stock coils. These coils are specifically designed by the company engineer to match the circuitry of the particular unit that you are using. A more in-depth answer to this question comes in two parts. The first part has to do with the detector circuitry and coil design. Environmental factors make up the second part of the answer. 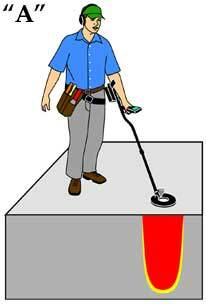 How Do You Setup a Metal Detector? "Xing" the target with your coil is the most common type of pinpointing. To "X" a target, run your coil over the target and make a mental note of where the audio signal is the loudest. Start with your normal right to left sweep to find the loudest audio signal. You should shorten your normal sweep down to about two to four inches. Once you have a good idea of where the target is, run the coil 90 degrees over the target to tighten up the pinpointing. You can do this one of two ways. First, you can physically step to the left or right of the target so that the coil goes over the object using a normal sweep but turned 90 degrees. Second, instead of stepping to the side and sweeping the coil left to right, you can push and pull the coil forward and backward over the target. Try using both methods to find the one that works best for you. Pinpointing with a wide scan or double-D coil: The wide scan coil is slightly different from the concentric coil. By design, there is no center spot on the coil but a center strip of pinpointing area. The best pinpointing method is to use the very front of the coil or toe or the very rear portion or heel of the coil. Once you have gotten the signal, back the coil away from the target and use the toe of the coil to find the best signal. Pinpoint in the usual manner after that. To use the heel of the coil, push the coil past the target and use the end of the coil closest to you for the pinpointing. Regardless of the type of coil or the pinpointing method that you feel most comfortable with, practice will make you a better pinpointer and save you time and effort in the field. How much discrimination should I use? What is Ground Balance on a Metal Detector? Ground balance is a form of discrimination that cancels out the effect of mineralization on metal detectors. It finds the balance point where the effects of the ground are neither too positive nor too negative. When a detector is set with a positive ground balance, it will react to the mineralization matrix just like a target. When this happens, you will get an audio signal and targets in the ground will be masked by the mineralization. If a detector has been set up with a negative ground balance, the detector is discriminating out the ground and will go silent. A severe loss of depth and sensitivity are the results. Manual ground balance is used on detectors designed to work in highly mineralized conditions. The ground balance is set by the user and is tuned to the local ground conditions. In bad ground, a manual ground balance can give you better depth and sensitivity than a factory preset. Unfortunately, if the ground balance is set incorrectly, a loss of depth and sensitivity will result. When working with a manual ground balance, constant attention is a must. If the ground conditions change, the detector must be returned to the ground matrix to ensure the best operation of the machine. Manual ground balancing is a learned skill and must be practiced for best results. While manual and preset ground balance are pretty clear, automatic ground balance causes some confusion. In the earlier days of metal detecting, any machine that was not a manual ground balance was referred to as an automatic ground balance. The term was used because the detectorist did not have to tune the machine; it was "automatic." In the late 80s, several detectors were introduced that had microprocessor controlled ground balance. That is to say that the detector sensed the ground condition and reacted to change by adjusting an internal electronic potentiometer. True automatic ground balancing had arrived. Some manufacturers and dealers still use the automatic title for factory preset machines. If you have a question about whether or not any detector is truly an automatic ground balance or not, check the machine with a mineral sample. If the machine actively tunes to the sample, it is an automatic. The more advanced detectorist or one who is hunting in much mineralized soil (gold prospecting or relic hunting) should get some form of adjustable ground balance. Manual ground balance is good for the avid hunter who wants to be able to tune the detector to his exact specifications. Depending on ground conditions and personal hunting habits, a slightly positive or negative ground balance can help the detectorist find targets. An automatic ground balance will always tune to its programmed parameters and can't be fine-tuned to the user's specifications. If you have a manually adjusted machine, it is very important to make sure that you are very comfortable setting the ground balance. You can practice this in your backyard or anywhere you can find a small area with no metal targets in the ground. Spinning the knob one way and setting the balance, then spinning it the other and resetting the balance is a good way to practice this skill. If you practice these just five minutes a day, you will get very good at ground balancing. High Output Technology combines the increased transmitted signal and the high gain amplification of the return signal to get the best depth and sensitivity out of our lightweight, compact detectors.When a detector becomes chirpy, the most common reason is the noise to signal ratio. Signal refers to the information being passed through the circuitry and noise is any type of other interference. As the signal is amplified, the noise gets amplified as well. At Tesoro, we use high tolerance components and design them into the circuit to create a lower noise to signal ratio. A basic detector works by transmitting a signal and receiving it back. This creates a field of electromagnetic flux lines around the coil. As metal passes through the field, it breaks or distorts the flux lines. A simple discrimination circuit measures the amount of distortion or shift and beeps or doesn't beep based on the settings of the machine. During the design phase of any metered-style machine, the engineer measures the amount of shift that the most common targets cause and programs a microprocessor to respond with a meter reading for those types of shifts. The testing can include simple air tests, field tests in a controlled environment, such as a test garden, or even complex reports from several different field testers. But at some point, someone decides that a type of target shift represents a specific meter reading. While this information can give a detectorist a basis to dig or reject a target, it is in no way perfect. When using a notch filter, check the setup by doing numerous air tests before taking it out to the field. It is to your advantage to make sure you are aware of how your detector reacts to both good and junk targets. If your Notch can be adjusted, tune it to knock out the most common types of pull tabs in your area while keeping in the targets you wish to find. The initial setup can be a bit time consuming, but once it is done, you will be able to find less junk targets and keep the good finds. Can Iron be Rejected and Gold Nuggets Still Found? The big difference is in the makeup of the actual penny itself. Older pennies, ones made before 1982, including the wheat back-style, are almost pure copper and will read up in the range of dimes and some other silver coins. The newer pennies are made mostly of zinc and tend to read in the screw cap range. Frequency shifters change the transmitted and receive signals just slightly enough to keep another detector from interfering with yours. Moisture in the ground by itself has very little effect on the operation of a metal detector. Fresh water, such as rain or irrigation, is not much more conductive than the dirt it soaks into. Most metallic items in moist soil will start to corrode. As these items start to break down, they create a halo of super mineralized soil around the target. The halo effect makes the target appear bigger to the metal detector. Iron and other ferrous targets will corrode faster than other targets. Gold does not corrode, and silver, copper, and brass corrode more slowly than iron. So, while the halo effect will work on some targets, it will not work on all. Saltwater is a little different than freshwater. Due to its nature, saltwater is more conductive than fresh. This may give a little extra punch down into the ground but will also cause most machines to chirp and chatter quite a bit more. It is especially bad at the surf line on a wet saltwater beach. You can effectively tune out most saltwater effects when the saltwater is consistent (when the coil is covered by a foot or so of water, for example). Along the surf line, the waves are still washing up on the shore and the sand is drying out. This causes pockets of sand that may be higher or lower in conductivity than the surrounding area and can play havoc on your detector. It is best to hunt in the Discrimination mode with the Discrimination knob turned up high enough to knock out iron and foil. This will cancel out a good portion of the saltwater effects. You may also have to turn down your sensitivity to stabilize the detector. Every detectorist has a slightly different style and likes a different type of headphone. For each style of hunter and hunting, there are several headphones. On the other end of the scale are Walkman or ear bud-style headphones. They will concentrate the signal in your ear but will allow you to hear the surroundings around you as well. Ear buds are also much cooler to wear during the hot summer months. Headphones take much less current to drive than the speaker in the detector. This fact by itself would tend to show that you will increase your metal detector battery life by using headphones. But you have to remember that even though the detector is not making any noises, the electronic circuits are still running. A detector that generates a square wave or has a display will be using more power than a detector that is using a sinusoidal wave and has no display. The increase in battery life will depend on your detector and hunting style. Are Rechargeable Batteries Better than Alkaline? There are two aspects of rechargeable batteries to consider. The first is cost. Rechargeable are quite a bit more expensive than regular batteries, but the cost is offset so that you will not have to buy them as often. The second consideration for rechargeable batteries is the voltage. Most rechargeable have slightly lower voltage than their counterparts. Alkaline batteries have a voltage of 1.5 volts per AA cell. Most rechargeable batteries have a voltage of around 1.2 volts per AA cell. If your detector uses 8 AAs, you will have 12 volts with the alkaline and roughly 9.6 volts with the rechargeable. This should not affect your depth and sensitivity, it but will affect the time that you are able to hunt.